The Plucky Canadian - by Angela McAffee (Yeh, eh? ): Living A Thousand Lives, or Chocolate Brain-Food, or Kundalini Says What? Living A Thousand Lives, or Chocolate Brain-Food, or Kundalini Says What? Amazon Prime Day Tomorrow! No they didn't pay me for that. I'm just excited. Also, I fell asleep reading to Ellie tonight. We read ‘A Moose’s Very Canadian Christmas’ and she asked me to stay for thirteen minutes. I stayed for THIRTY minutes because I fell asleep around the seven minute mark. I worked at the studio today but everyone was home watching Soccer (or 'Football') and/or Tennis so it was sloooow. Then I rushed home so Bill could mow the lawn and he wasn’t home. Then I started eating an ice cream bar because, hey, I was alone in my own house and that NEVER HAPPENS. Then I shouldn’t have spent the next 12 minutes going from the freezer to the fridge to the pantry trying to decide which unhealthy treat I wanted to indulge in by myself. Chips? Chocolate? Ice cream? What treat would give me the most YES bang for my ‘I get to eat alone’ buck? Croatia lost. Serena lost. And my friend Lorna left to go back to Canada Saturday so there’s that. Kind of a crummy weekend, eh? But I’m reading a new book. (Success and the Spirit if you must know.) I might be doing an intro to Kundalini yoga workshop in the fall and I am SO EXCITED! I bought three new books. One is coming allll the way from Russia. Why it’s only in print in Russia mystifies me also. It isn’t here yet. Will it smell like Russia? What does that smell like? Fur and vodka? But the book I’m reading now (Printed in New Mexico…much closer) has some printed lectures from Yogi Bhajan and some history about Kundalini yoga and where it came from. (Indian dude named Guru Nanak in Northern India/Pakistan, about five hundred years ago). If you must know. He was a pretty revolutionary little guy for the time. Saying women should be educated alongside the men and your caste shouldn’t limit you from searching for happiness in whatever job you find it in. Bold. Scary stuff, eh? Also that it doesn’t matter what religion you identify with, you deserve respect, dignity, and help if you need it. Clearly I identify strongly with this. I’ve met kind, charitable, Muslims, Jews, Christians and Sikh’s. Each sincere in their faith, each earnestly seeking closer communion with God, and striving to be the person God wants them to be. Is it a little scary talking to someone about their faith when it is completely new territory for you? Yeah. Sure. Of course. Is it also interesting, humbling, and right? Yep. 1) God wants you to be happy. Life is not set up for us to suffer. Eh!? Anyone out there make T-shirts? I need these on a T-shirt. Maybe just the first one. I don’t want people stopping and staring at me long enough to read the second one. The second chapter is called ‘The Purpose Of Life’. I know. Doesn’t that seem like a final chapter kind of thing? Or a first chapter kind of topic? H-E-A-V-Y. Right? Momma needs chocolate ice cream for the brain too. Oh and the kids are fine. Benji’s cutting his two year molars and Ellie is feeling anxious about it. Toby’s back is sore but he’s doing fine as long as I can keep away the mini demolition man (Benji) from leaping gleefully on his back and scrunching his fur painfully in his tiny, tiny fist. Some bumps, some bruises and scrapes but everyone is alive and growing taller by the second. Anyway, gotta go. 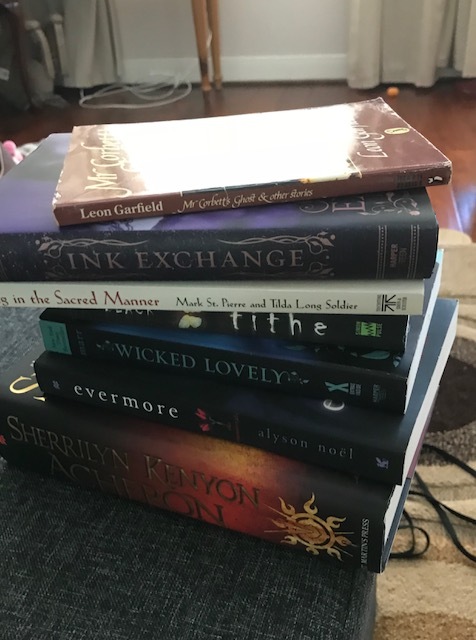 I’ve got a stack of yoga poses to investigate and another fairy-vampire romance to read. “A reader lives a thousand lives before he dies. The man who never reads lives only one.” George R.R.Martin.